We leave or a long weekend to visit friends soon. I can’t consider a trip until I complete my current six month journey through a new book manuscript on women's western art. Once my second book on Remington's art was accepted, edited (??? See prior post), and sent to the printer, I trekked through research on women who painted the west. I’ve hit roadblocks, encountered detours, gotten lost, run over rough roads, and slogged an uphill drive. The trail led through research book after book.I plan to include thirteen women - one painting or sculpture each. Roadblocks led to deceased collectors who sold works or hid away objects/information and left no paper trail. The worse roadblock occurred when one estate wanted to charge one-fourth of my total book advance for the use of only one picture that could not go on the cover. Side trips led to more artists whose work and information were equally hard to uncover. Detours required that I research and write other article assignments, post blogs, update social media, and plan a book release event. I crashed one roadblock on a trip to Fort Worth, Texas. 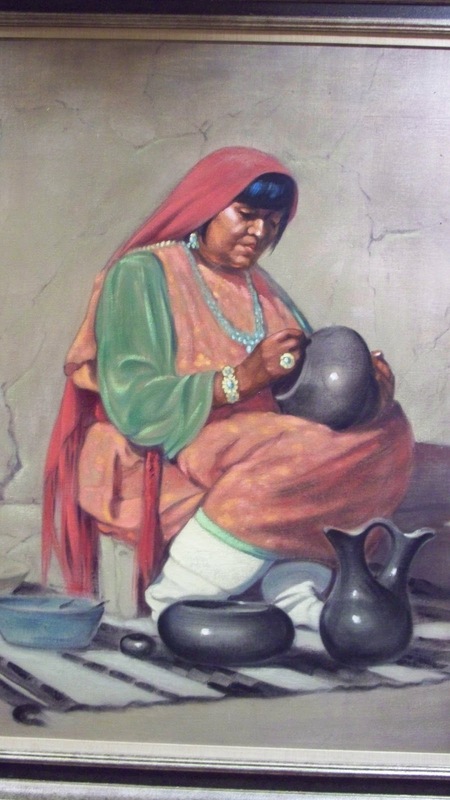 The Burlington Northern Santa Fe Railway’s art collection includes many women western painters. The company offered permission for the use of any I choose at no cost. YEA! When people think of a woman western artist, the first who comes to mind is Georgia O’Keeffe. However, her popular close-up flowers fail to invoke the images I seek – images of how the old west looked around the turn of the 20th Century. Finally, research uncovered a painting that fits. A friend edited pages for me, checked for punctuation, understanding, and spelling. All that is left is the 250 words about O’Keeffe and a tweak to the backmatter suggestions for further readers’ learning. I’m approaching my destination – submission of the finished manuscript. Then I’ll look forward to flying off for a relaxing long weekend away from the computer. The rough roads may not teach us anymore about ourselves than the smoother ones, but we tend to remember them more. Keep up the travels and the writing! And enjoy the getaways! Thanks, Dean. I have an idea for the fourth book! I think you deserve more than just a long weekend after all that, Linda. I'm glad you didn't give up when the obstacles began to pile up. This sounds like such long hard work.Enjoy your break! You are right! But well worth it in the long run when you see your book in the hands of readers. I'll start immediately on a fourth book! Thanks, Pat. I think this book will really interest children - even boys. If I have my way, it will begin with an O'Keeffe skul! That sounds like a very interesting and consuming project. Congrats! You deserve a brake. Enjoy it. Such a wonderful idea for a book. I haven't studied much art, but you have me interested. Good luck! Writing can be a wicked, twisting road indeed. Glad you decided to take a break for a bit!